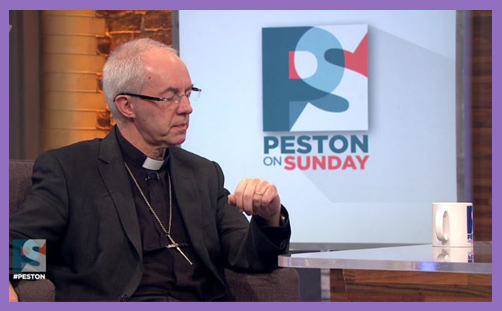 The Archbishop of Canterbury Justin Welby was interviewed by Robert Peston on Sunday. He spoke about the British economic model, economic justice, investment, skills, apprenticeships, automation, robotics, AI, equality for all, food-banks, housing, Brexit, Northern Ireland, trade, unionist identity, the Good Friday Agreement, public enemies, and media headlines which stir up hate and division. Before you kick him, he also spoke about Jesus’s command to care for and love the poor, the judgment of the Old Testament prophets, the need to build communities by loving one another, and the imperative of reconciliation with God through Jesus Christ. Then Peston mused about the “amazing support” which Donald Trump has from Christians in America. “Do you understand why fundamentalist Christians in America are so supportive of Donald Trump?” he asked the beaming Archbishop. Marvellous, thought the ‘Peston on Sunday’ producers, as they contemplated the imminent Twitter storm and media furore. Marvellous, thought Christians everywhere: the transparency, integrity, honesty of the man. What a breath of fresh air. And then it comes: “No, I don’t understand it. I really, genuinely, do not understand where that is coming from,” said the Archbishop, speaking exactly as he thought. 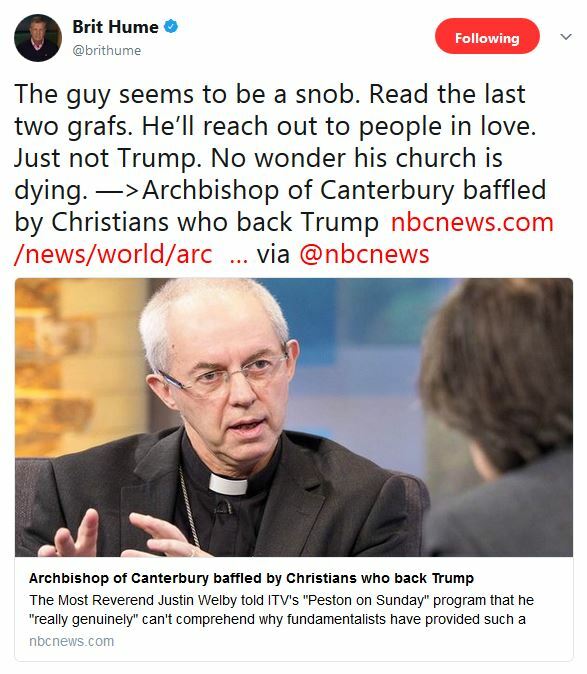 So, when the Archbishop of Canterbury tells the world that he really, genuinely, does not understand the Christian ‘fundamentalist’ support for Donald Trump, he might first listen to himself, because he manifestly does know. 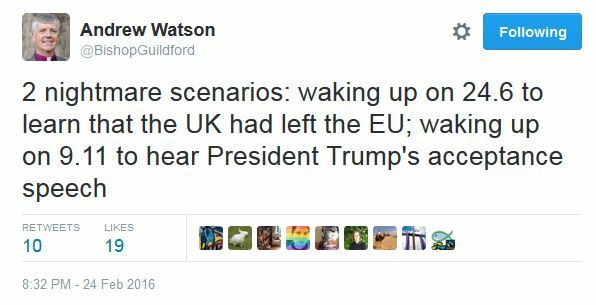 There are Brexit-supporting Christians, and Trump-supporting Christians. It isn’t for the leadership of the Church of England to pass partisan judgment on their spiritual discernment or political motives, not least because it’s such an appallingly divisive witness.